Amelia H. Jones sends a packet of picture-post cards and Christmas cards that can be used to decorate the school and homes of the poorest pupils. 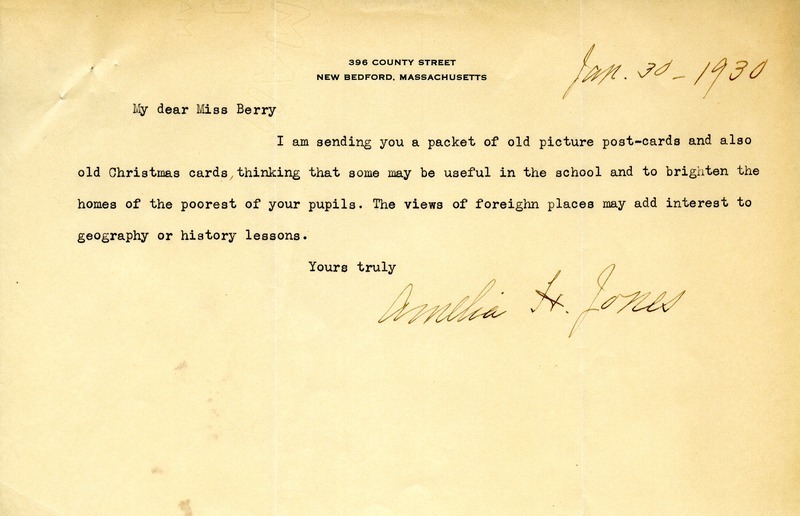 Ameilia H. Jones, “Letter to Martha Berry from Amelia H. Jones.” Martha Berry Digital Archive. Eds. Schlitz, Stephanie A., Chelsea Risley, Alan Henderson, et al. Mount Berry: Berry College, 2013. accessed April 22, 2019, https://mbda.berry.edu/items/show/12998.